In the first trimester of your pregnancy, you're more likely to be feeling exhausted and suffering from morning sickness, which can mean that you don't feel much like exercise. But it's really important to stay active and there are loads of benefits associated with this. Walking is one of the easiest ways to get moving – and 150 minutes each week is the perfect amount. Just 30 minutes of walking a day, broken down into 10-minute chunks, can help give you more energy, make you sleep better, and reduce stress. There are other gentle ways to get going too. Swimming provides you with some great all-round exercise and as your bump grows the water will support you. Lots of local pools also run aquanatal classes, which is a great way to get active and meet other mums-to-be. Alternatively, if dance is more your thing, you don't even have to leave the house. Just turn on the radio and boogie around your living room! And don't worry if you were inactive before you fell pregnant. There has never been a better time to adopt a healthier lifestyle. Just don't rush into strenuous exercise. If you are unsure, talk to your GP or midwife. Remember, exercise doesn't have to be strenuous to be beneficial. And in hot weather it is advisable to take things slowly and drink plenty of fluids to stay hydrated. As your bump grows bigger, it can be tempting to put your feet up. But even when you're feeling tired you should try to take a walk every day to give you more energy. and reduce any feelings of anxiety you may have. 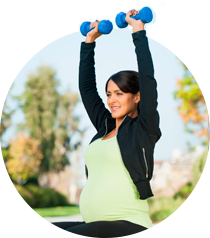 Staying active will help with the physical demands of pregnancy as it makes you stronger so you can carry the weight of your growing baby. And it can also help you cope with labour better too. Not only that, it also helps you maintain a healthier weight and can make losing your baby weight that bit easier after the birth. 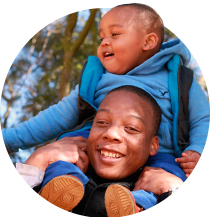 So keep mobile whenever possible – get off the bus one stop early, use the stairs, walk the dog and if you've already got little ones, this is a great excuse to get them going too. And instead of asking a friend round for a catch up, meet them in the park to walk and talk. 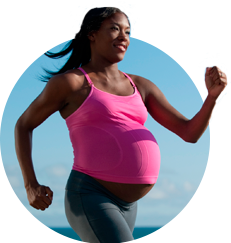 If you're working throughout this stage of your pregnancy, you might feel there's not always time to fit in exercise. But remember, your recommended 150 minutes of exercise a week can be broken down into 10-minute chunks. For example, delivering messages in person rather than by phone or email and going for a walk around the building in your lunch break will soon add up. As well as this, you can try to incorporate some simple stomach strengthening exercises to ease back pain and foot exercises to help blood circulation. Pelvic floor exercises help strengthen those all-important muscles. You can feel them if you try to stop the flow of urine when you go to the toilet. To work these muscles, sit comfortably and squeeze them 10-15 times in a row. In the first few weeks and months after giving birth, this is the time new mums are often cooped up in the house as they try to establish a routine. But staying active is still really important. Getting out and about does wonders for your wellbeing, and can help ease feelings of post-natal depression at this very emotional time. Walking is still probably the easiest form of exercise as you adapt to your new lifestyle – take a stroll to a friend's house or to the shops instead of driving or park your car further away than normal to ensure you take a few extra steps. Even very little babies love to move – and it's good for them! They need 180 minutes of activity a day – but don't worry, it doesn't have to be all at once. Breaking it down into smaller chunks of 10 or 20 minutes will make it a lot more manageable. When baby is awake, let them enjoy free play on the floor for as long as they want. This will ensure that their muscles, bones and brains develop properly. 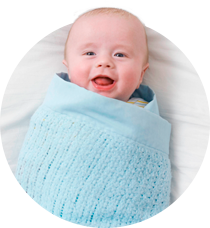 Getting your baby out of their cot or rocker for a cuddle or a game of peek-a-boo is a great way of getting them to interact and move their muscles. They also love to kick their legs and wiggle about so make sure they have enough space when they lie down. Babies were born to swim, so consider taking them to baby swimming classes. They'll love having a splash around in the water! Just make sure you have had your six-week check up before jumping in yourself as there is a risk of infection. Although it's easily done, try to avoid leaving your baby in their buggy or car seat for extended periods of time. Car seats in particular can be very restrictive and they can overheat your baby too – try to only use them when travelling. Even too tight clothing can stop them moving freely. It's important to keep an eye on you baby and if they are looking fidgety, give them some more room to explore. As your baby grows, remaining mobile continues to be an essential part of their development. At this time they are becoming more interactive and there are so many ways to enjoy new activities with them. Little ones love being sung to or talked to so sing a song or nursery rhyme, clap their hands and get them moving to the beat. Even bath time can become a fun way to splash and play. As your baby gains strength they will become more independent by rolling over and learning to crawl. Suddenly the living room is an exciting place to be and they will want to explore every inch, so make sure they have plenty of space to discover their surroundings safely. Although babies often enjoy the bright colours and unusual sounds of the television, those who watch too much will have less chance to be active. So instead of allowing them to sit still, encourage them to move around and play. And while baby is being active, this is the ideal time for you to get moving too. Mums often feel under pressure to lose their baby weight but don't worry about it too much. Doing short bursts of gentle exercise can help you lose any extra pounds in a steady and sensible way. Now your baby is starting to totter, then walk, the possibilities are endless. If they are just finding their feet, practice makes perfect so ensure your baby is free to get up and move around whenever they get the urge. As they become a bit more stable, your toddler will enjoy trying new things. Play their favourite tunes to get them up dancing, take them out in the garden for a game of throw and catch or head to the park to kick a soft ball with family and friends. It's great for their co-ordination, balance and agility – which are all really important skills they will rely on when they start school. Nowadays, children are getting to grips with new technology at an even younger age. Although developing these skills is important too, mobile phones, tablets and video games can be addictive, so try to limit how long you let your little one play on them for. Find out if there are any pre-school groups near your home and what's going on at your local leisure centre for parents and toddlers. Joining a class or group will give your toddler the opportunity to play with other children and help them learn new skills. It might even help them – and you! – make new friends. Once your toddler has learnt to walk, they won't always need their buggy anymore. It may take you a little longer to get places but where possible, walking is an ideal way to keep them fit and healthy, while building their confidence. And now they are on the go, you will be too! Running, playing and swimming with your toddler will increase your fitness levels too and leave you feeling more energised to cope with the demands of motherhood.